Apple's new groundbreaking strategy revealed: just throw a "+" on it — Secret Sauce - Tech news, explained. Yesterday, the tech world gathered to watch Apple employees try to keep a straight face while saying “we’ve completely rethought the… [insert new Apple product]” to introduce a mundane new product line. Apple News+ actually makes a ton of sense -- $9.99 a month for access to over 300 magazines and newspapers is a steal. Between the two of us, we already subscribe to the WSJ, LA Times, Bon Appetit (see Zac-shuka), and Condé Nast -- and those subscriptions add up, so consolidation is a no-brainer. And for us tech enthusiasts, Apple News+ includes TechCrunch Extra Crunch (a new line of premium content), Wired, and Fast Company. Sounds great for us, but how do the publishers get paid? In the same way Spotify pays artists by stream count, Apple will pay publishers by the time readers spend on their articles. So, like Spotify’s streaming payouts, it probably won’t be super lucrative for small publishers but could mean serious revenue in aggregate for the industry. 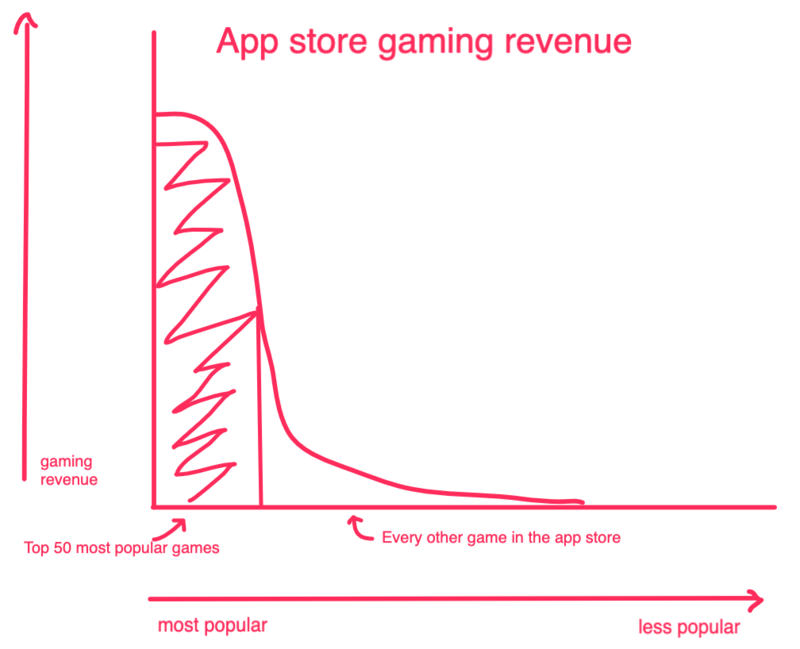 iOS gaming may be a $100 billion industry, but the top grossing apps (many of which a free with in-app purchases) bring home most of the bacon. Apple Arcade aims to make iOS a more attractive platform for both the indie developers and major studios that sink a lot of time and money into making paid games that aren’t given the attention Apple thinks they deserve. While the subscription-based game service is great for those who want more out of iOS gaming than Candy Crush, we expect a majority of the gaming community (us included) to be far more excited about Google’s new cloud-based gaming service, Stadia. 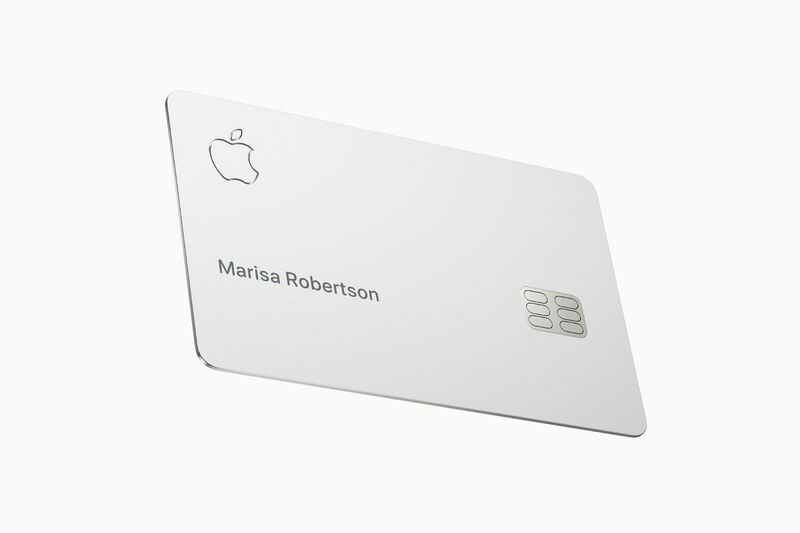 It was only a matter of time until Apple added its own credit card to the Apple Pay service. The Apple Card, issued in partnership with Mastercard and backed by Goldman Sachs, offers 2% “Daily Cash” on everyday purchases and 3% back on Apple spending (app store, Apple hardware, etc.). Instead of issuing cash back at the start of a new billing cycle like other credit cards, you get the cash back the same day. The card has no fees and the Apple Pay app has been revamped to make spending more transparent and interest payments easier to understand. While the shiny new card will definitely attract Apple fanboys, there are better credit card options when it comes to rewards and plenty of personal finance apps that offer similar services. 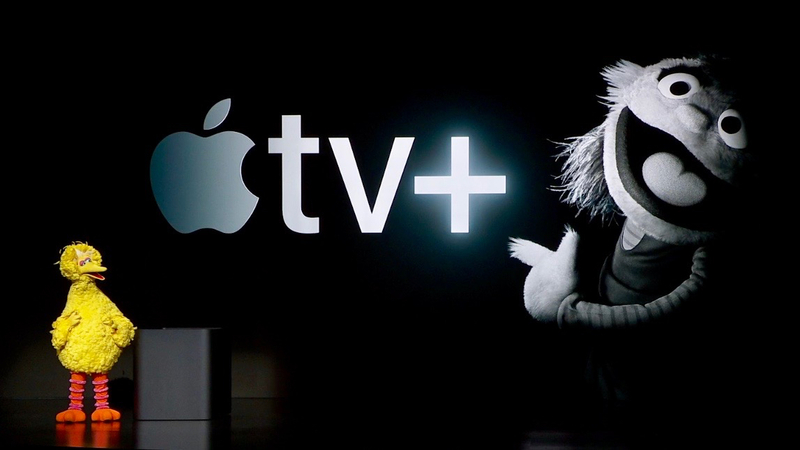 Apple TV+ service will include a revamped Apple TV app that promises to bring all your streaming programming into one place -- although it doesn’t look like anything that Roku or Amazon Fire TV isn’t already doing. In terms of original content, they centered the pitch around a few new shows including an Amazing Stories reboot from Steven “streaming service productions shouldn’t win Oscars” Spielberg, which was funny. Also we still don’t really know if the Witherspoon-Aniston-Carrell The Morning Show is a drama or a satire. 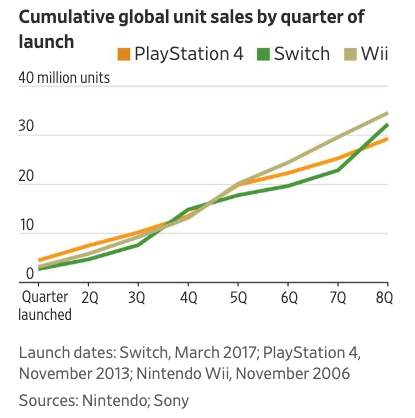 Nintendo is planning to release two new versions of its hit Switch console later this year -- the device was originally released in March of 2017 and has since outsold the PS4 after the same amount of time on the market. Details are sparse, but we know there will be a high-end version (think PS4 Pro or Xbox One X) and lower price point model focused on handheld gameplay. The Switch is Nintendo at this point -- the device current accounts for 80% of the company’s revenue. Nintendo is hoping the refreshed devices alongside new Animal Crossing and Pokémon titles slated for later this year will keep sales from slowing. 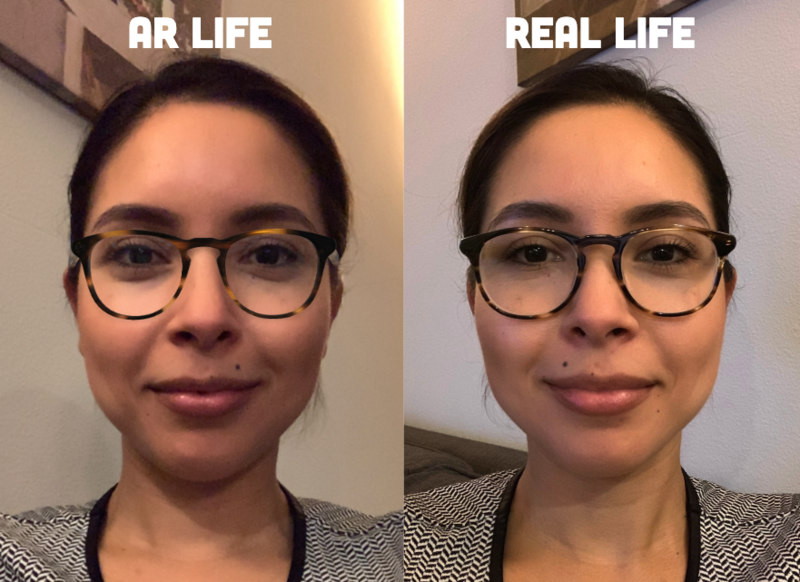 Warby Parker released a new augmented reality (AR) app last month so shoppers can check out what glasses might look like on their face before ordering -- and it’s pretty awesome so let's talk about it. Why is this app necessary, can’t you try on glasses at home? Great question. Yes, the home try-on program works great and is arguably what made the company work in the first place. But it’s actually still pretty tough to pick five glasses that will look good on you based on modeling shots online -- at least it was for me (this is Brendan btw). Up until this point my interactions with AR were mostly limited to putting a panda Animoji on my face during FaceTime calls to piss people off so I’m no expert, but it really did make the purchase process much smoother. My girlfriend was actually in-market for a new pair of spectacles from Warby Parker a few weeks ago so I suggested she give it a try. She started by filtering for frame shape/material and then previewed her favorites one by one. 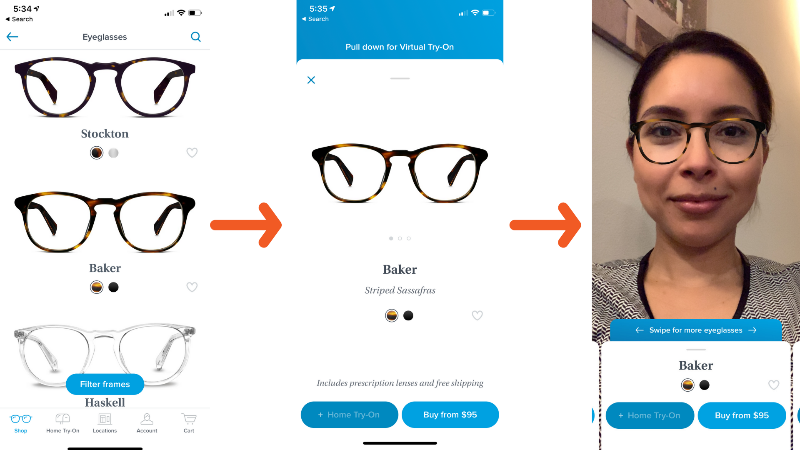 The entire process from downloading the app to having 5 frames selected for home try-on took her about 15 minutes, which is a pretty great eyewear-selection experience in my book. It’s not a perfect life-like rendering but it’s good enough to decide which glasses definitely don’t work so you can decide on the right five pairs to try on at home. 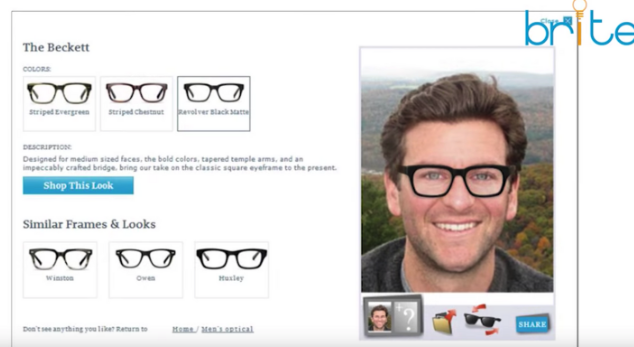 This actually isn't the first time Warby Parker has tried pulling off this feature. Before they launched in 2010, there was an option on the site that allowed you to superimpose glasses on your face. Unfortunately the technology wasn't quite there yet and the renderings were pretty terrible.